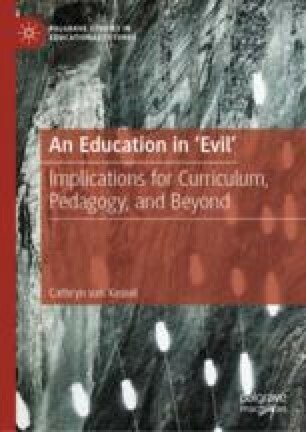 In this book, readers have been asked to consider how different understandings of evil might shape how individuals and societies live together, which is a fundamental line of inquiry in education. The study of evil—how we might understand it as a process, and how exploring this topic can affect us—is one piece of the puzzle whereby we explore the sort of relations we want to have with others. Although an uncomfortable thought, knowing that evil can be ordinary and perpetuated by individuals and groups like us frames discussions in a way that illuminates our own responsibility to take care of others. Shaw, J. (2019, February 15). Evil is in the eye of the beholder. The Globe and Mail. Retrieved from https://www.theglobeandmail.com/opinion/article-evil-is-in-the-eye-of-the-beholder.